LIGHT MATERIAL ( Low specific gravity ) for reducing total prroducts weight. PARTS FOR SAFETY. For example parts for breaking system and suspension for automobile and motorcycle. Because aluminum forged parts have more precise material formation and flowline and also no cast comb defect comparing with casting and diecast process. At the accident parts will be deformed without cracked. 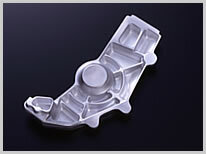 NSC will propose aluminum forging shapes for less WT.Parts needs. NSC has rich experience and long history as alminum forging specialist.